Due to its UV sensor and the integrated microprocessor the UV-Probe Integrator can measure and display the peak UV-intensity of the full UV spectrum (mW/cm2). Additionally, this UV-Probe Integrator is calculating the UV-dosage (mJ/cm2) of the UV energy supplied during the time of exposure of one measuring cycle. The UV-dosage is calculated as the total Integral of UV-dosage over the full UV spectral bands. The removable, probe-type sensor is connected to the base unit by a cable of approx. 1 meter (40”) length. 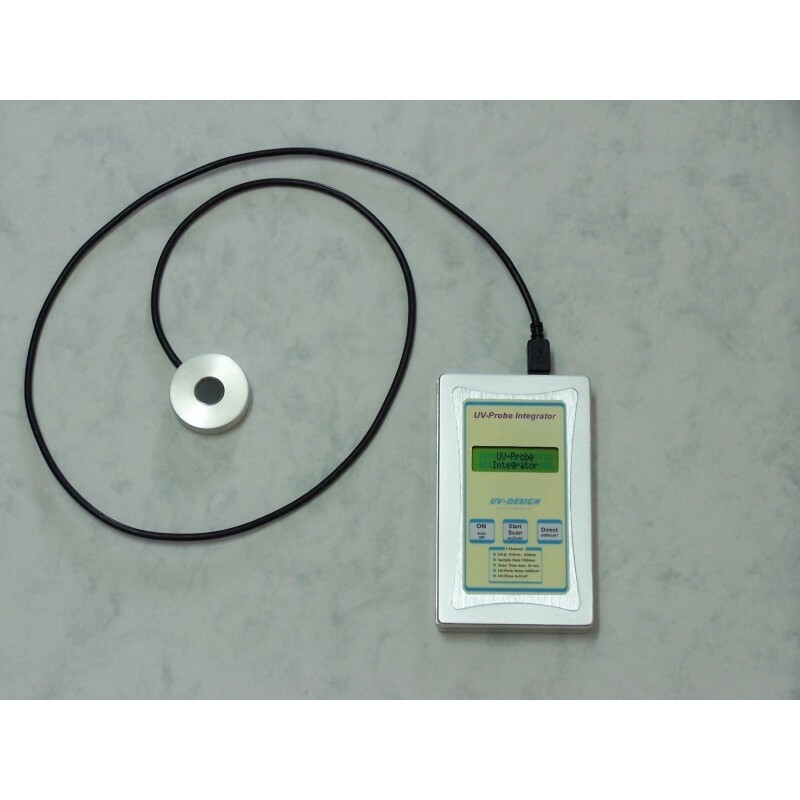 In the function “Direct” the actual UV-energy in mW/cm2 supplied to the sensor is measured. The function “Scan” will start a 30/60 second measuring cycle of both, UV-intensity and UV-dose. After completion of the measuring cycle the measuring results can be scrolled through on the built in 2 x 16 digit LCD display. While measuring, the UV-Probe Integrator can withstand max. 230° F / 110° C for up to 10 seconds. The temperature of the housing should not exceed 113° F / 45° C. Because of uneven radiation distribution of the UV light source and different type of construction of the measuring devices by different manufacturers, different readings may appear under the same measurement conditions.